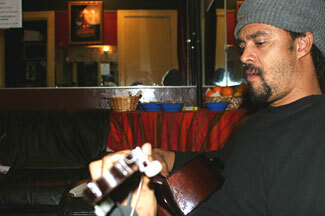 Sitting in the dressing room of San Francisco's Fillmore Auditorium with Michael Franti of Spearhead, I had the opportunity to do a photo shoot and brief interview with him. Franti, relaxed and seemingly sinking into the couch, strummed lightly on his classical guitar as he pondered my questions. The answers rolled easily off the tip of his tongue, in a calm but firm voice. 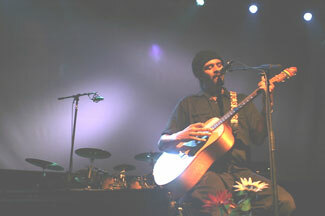 Franti, displaying an air of honest passion, has always been a man of action. Since his childhood he has idolized musicians/activists such as Gil Scott-Heron, who like Franti was a great social rights messenger. 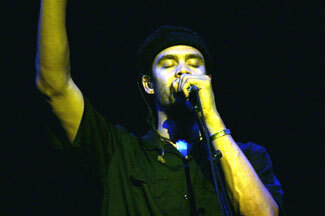 "The Message to the Messenger" was an important Scott-Heron piece in which he addressed his fellow musicians, telling them of their responsibility to address social issues. Franti takes Scott-Heron's message a step further saying, "I feel like we are all messengers, so my message is to everyone, I feel like we are all musicians, anybody who has a voice, and so I don't feel it's someone's responsibility just because they are an artist, to talk about social issues, I feel it's your responsibility because you are human being." 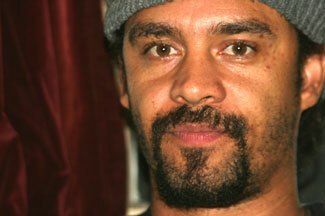 Michael Franti and Spearhead are conveying the message to the messengers, in his eye every one of us is a messenger. Franti has always displayed nurturing qualities, encouraging the many thousands who make up his audience to contemplate issues that we should all be involved in resolving. As Franti said "The seeds that are planted in the lyrics" are bits of knowledge for tilling, growing, and harvesting. Michael Franti's enigmatic personality shone with the rest of Spearhead at the legendary Fillmore which has seen the likes of Miles Davis, Pink Floyd, The Grateful Dead, and Jimi Hendrix to name a few. 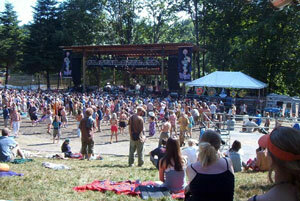 The venue retains its reputation for hosting acts on their way to greatness. 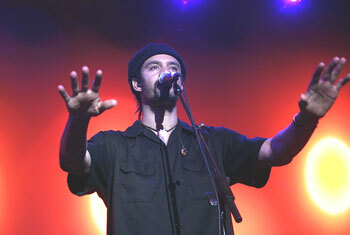 Michael Franti and Spearhead entertained the audience with stylistic variations of hip-hop, reggae, soul and funk. The music was not hollow; it contained a message and a purpose. Franti said he lets those "who want to learn" learn. He isn't forcing his beliefs upon us, but presenting them for the conscious mind to contemplate. He presents a unified diversity in his performance through the use of multiple media such as film, lights, word, music, and movement. I was very impressed to see a woman on stage using American sign language to convey Franti's words to deaf audience members, because as he said during the song "Everyone Deserves Music"--"Not only the hearing but the deaf deserve music." Franti displayed a powerful passion for words, and song. My message is to everyone... I don't feel it's someone's responsibility just because they are an artist, to talk about social issues, I feel it's your responsibility because you are human being. JamBase: It is inspiring to see someone like yourself exploring the many resources for political change through media. In addition to your outspoken, uncompromising political commentary you convey your message through multiple styles of music, poetry, and film. On a recent trip to the Middle East you shot a video documentary, in addition to many personally shot photographs. How do you feel your utilization of multiple media has given you a more defined understanding of the issues you present? Franti: Well, I think that as a communicator you have to try to use every means at your disposal to communicate, and the great thing about film is you can combine a lot of things. You can combine images you saw, you can combine the natural sound of what you heard as you recorded it, and then you can also add music to go with the images. I found as we made this film, in addition to the people interviewing people and the people talking about their lives, sometimes just seeing a face and hearing melody and words tells you and gives you so much more in terms of the emotional content, as opposed to someone explaining to you what life is like in Iraq. Now we've started to incorporate a little bit of this imagery in our shows. You know, and just trying to make our shows visually compelling as well as musically. JamBase: Many artists use one form of media to promote their cause, are you using multiple media because you believe you can reach multiple audiences hence more people? Franti: Yeah, I think you can reach different audiences. You can, when you're broadcasting something in a theatre or through television, you reach people who you know, watch TV, or go to films, but they might not necessarily go to a concert. But more than that, you are reaching people in a different way, it's not just who you are reaching, it's the way that you touch them. And that's really what I'm interested in is finding new ways to hit the emotional content. That's what I feel like is missing today from the nightly news, it's missing from journalism, it's the emotion. If you hear, or you see someone who's lost their limbs, you hear somebody whose family has just died talking about it, just through seeing their face; it's in their eyes, you don't need to explain any further. It makes a much better case against the war then talking about tactics or political things. Have musicians such as Gil Scott-Heron inspired you to give a "Message to the Messenger" encouraging other artist to fulfill their responsibility to utilize their powers to promote issues they believe in? Well, Gil's really inspired me a lot. One thing that he said is that "the role of the poet is to make the complex easier to understand" and he's great at that. I'm not so good at it. But, the thing about "The Message to the Messenger," is that I feel like we are all messengers, so my message is to everyone. I feel like we are all musicians, anybody who has a voice, and so I don't feel it's someone's responsibility, just because they are an artist, to talk about social issues, I feel it's your responsibility because you are human being. It doesn't matter if you're a garbage collector, or you are working at a dentist's office, or whatever. When called upon to express your feelings about the direction of the world, it's important that we all do it. Music is great, I always say I don't know if music can change the world overnight, but I know it can help us make it through a difficult night. That in itself is really the responsibility of a musician, to make great art. Is the relationship between your musical career, political activism, and work with such groups as the Sandinistas symbiotic, and how so? Well everything I do is all related, whether it's musical, or political it's all the same to me. I write about things that are close to me in my heart. If I meet a group of people, and I connect with them, chances are that some part of that experience is going to enter into a song somewhere. It might not be a direct reference; it might just be an emotional reference to that way I was feeling at the time. Do your different ventures of educating people ever conflict with each other? Well that's the thing, I hate education. I think it's more important to inspire people. I don't think you can teach people anything with a guitar, but you can help people open up their heart and they can discover what is already there. So that's what I try to do, and I haven't always been this way. There was a time when I thought you really could teach people through music. Then I realized you only reach people that know what you are talking about. That want to be reached? Franti: Yeah, but if you can find a way through some chords or melodies to reach somebody, they say they just love the music then eventually they find the seeds that are planted in the lyrics, they start to think about things. I've given up teaching people who don't want to be taught, If someone wants to learn something from me I'll share it with them, but I'd rather just try to inspire people who need inspiration and might not even know it.